In a 2016 study, over 31 million American adults reported having practised yoga at some point in their lives. Linked to many health benefits, yoga purportedly enhances both mind and body. Doctors have prescribed it for natural healing, and clinical psychologists use it for depression. The American Yoga Foundation has promoted Yoga Month and Yoga Journal, established in 1975, now boasts two million readers. Ashtanga, Bikram, Hatha, Iyengar and Vinyasa have become household terms for many. What role have psychology, psychiatry and psychedelics played in this story? In the 1960s many people were receptive to new thinking and practices. The famous psychologist Abraham Maslow, who came up with the hierarchy of needs, suggested people were adrift in a postmodern world: ‘We’re stuck now in our own culture… stuck in a silly world which makes all sorts of unnecessary problems.’ To break free, all manner of isms came to the fore: ecologism, conservationism, vegetarianism, veganism, holism. These accompanied growing anti-war sentiments and the human rights movement, as well as uncertainty. With society in flux, people sought peace of mind. And this led many to strive for perfection in mind and body. Meanwhile it also became apparent that transcending the present and greater communication were ways of coping with radical changes in the 1960s. Yoga and psychedelic drugs were seen as equally valid routes to spiritual fulfilment and mental health. As the San Francisco Oracle put it in 1965: ‘Yoga and psychedelics. Different means, same end.’ Supple bodies were related to healthy minds. Many felt that tripping out and artful poses led to new perspectives. Eastern religion, experimentation with yoga, and psychedelics all seemed a suitable alternative to capitalism, conservatism, militarism, racism, violence and the prospect of nuclear war. Experimentation also seemed a useful substitute for existing mental health strategies. At the same time, purely positive accounts of mental health services gave way to increasingly critical approaches. Think R.D. Laing and Thomas Szasz. Think Foucault and Fanon. Psychiatrists themselves had become ever more ‘sceptical’, and I’ve written in the British Journal of Psychiatry about 1968 in particular as a year where psychiatry was in transition: a year that rocked the world, changed everything and made us who we are. So much was happening 50 years ago in the realm of anti-psychiatry, diagnostics, and the politics of mind and drugs. People were looking for answers, for transformation. A mixture of yoga and psychedelics was the solution for some. One could effectively ‘trip’ towards God in the Downward Dog or on LSD (or both). Research and experimentation flourished. LSD, in particular, spawned a global interest in the cross-cultural dimensions of hallucinogens during the 1950s. Many researchers working in the mental health field expected to produce a ‘wonder drug’. Yet, the fusion of psychedelics and yoga was also driven by various personalities and organisations. For instance, Aldous Huxley, author of Brave New World and The Doors of Perception, combined a belief in the potential of psychedelics with Eastern religious thought and practice. He drew attention to the similarities between religious ecstasy and chemical bliss. The result of this mix, Huxley posited in 1958, would be a widespread religious revival based on ‘radical transcendence’. The famous Esalen Institute near Big Sur, California – which I wrote about in these pages in January 2018 – was founded in 1962 by Stanford graduates Michael Murphy and Richard Price. Murphy was apparently inspired to found Esalen by Sri Aurobindo, an Indian philosopher and yogi. He had spent time at the guru’s retreat in Pondicherry, where he absorbed Aurobindo’s cocktail of Eastern and Western thought that combined yoga and psychology. Richard Alpert (later Ram Dass), similarly, was able to take a transformative trip to India, where he immersed himself in Hinduism, Buddhism, meditation and yoga. He combined these perspectives with his psychedelic research, investigating the intersection of drugs with spirituality. Alpert viewed psychedelics, especially LSD, as the ‘sacraments’ of the countercultural movement and believed ‘that those religions which still provide an opportunity for direct religious experience will find a place for the psychedelic chemicals’. Timothy Leary took a more institutional approach to drugs and religious transcendence. His Acid Churches in New York State married the two practices with an eye to expanding America’s capacity for spiritual transformation. Then there was Stanislav Grof, an émigré Czechoslovak psychiatrist, psychedelic researcher, and one-time scholar at the Esalen Institute. In a feature piece for Yoga Journal in 1985 Grof recalled how he had mined Eastern thinking to supplement orthodox medical therapies. His goal was to create ‘a bridge between the relatively limited Western point of view and the maps of consciousness provided by the major mystical traditions’. (He also believed that breathing was essential to achieving transcendence.) Other mental health professionals featured in the pages of Yoga Journal too, including Arthur Janov (creator of primal scream therapy), Abraham Maslow (mentioned earlier), and the world-famous R.D. Laing. Not surprisingly, the response wasn’t all positive. And pushback to the blending of yoga and drugs centred on arguments about the cultural appropriation of Eastern spiritual language and metaphors. Yoga gurus with ‘large American followings’ regularly ‘dismissed psychedelics… and frowned on any mingling of drugs and discipline’. Meher Baba, a Sufi spiritual teacher in India, was a noteworthy opponent of yoga/psychedelic practices. In 1966 he penned the antipsychedelic article ‘God in a pill?’ and described LSD, mescaline and psilocybin-fuelled ‘spiritual’ experiences as ‘superficial’. Psychedelics were ‘positively harmful’ for the spirit, according to Baba, and he believed such substances should only be used ‘when prescribed by a professional medical practitioner’. 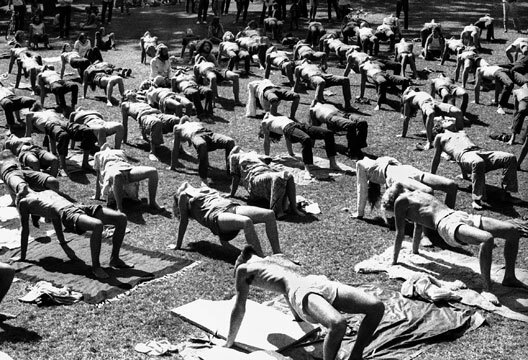 In the late 1980s and early 1990s the Yoga Journal published a series of retrospective articles on the 1960s’ preoccupation with altered states of consciousness. An emphasis on psychedelics immediately jumped out, and this reflected the deeply embedded role such substances had in American yoga culture. One article, for example, relayed how the trippers and yogis of the era had rediscovered ‘ancient knowledge about the potentials of the human mind’. Americans’ journey deep into Eastern religion was an attempt to break the ‘consensus trance’ that dominated ‘normal’ life. The meeting of psychedelics and yoga, according to this perspective, was simply a natural reaction. Drugs were a useful tool. Broad, W.J. (2012). The science of yoga: The risks and rewards. New York: Simon & Schuster. Crame, H., Ward, L., Steel, A. et al. (2016). Prevalence, patterns, and predictors of yoga use: Results of a U.S. nationally representative survey. American Journal of Preventative Medicine, 50(2), 230–235. Goldberg, E. (1999). The reorientation of Buddhism in North America. Method and Theory in the Study of Religion, 11(4), 340–356. Hoffman, E. (1988). Abraham Maslow, transpersonal pioneer. Yoga Journal, 81, July/August. Huxley, A. (1958, 18 October). Drugs that shape men’s minds. Saturday Evening Post. Lander, D.R. (2011). Start your own religion: New York State’s Acid Churches. Nova Religio: The Journal of Alternative and Emergent Religions, 14(3), 64–80. Lee, V. (1985). Spiritual emergencies. Yoga Journal, 63, July/August. Miller, D.P. (1990). Altered states revisited. Yoga Journal, 93, July/August. Miller, D.P. (1990). An interview with Charles Tart: Waking up from our everyday trance.Yoga Journal, 93, July/August. Osto, D. (2016). Altered states: Buddhism and psychedelic spirituality in America. New York: Columbia University Press. Richert, L. (2018). 1968: Psychiatry in transition – psychiatry in history. British Journal of Psychiatry, 212(2), 121. Sacks, O. (2012). Hallucinations. New York: Alfred A. Knopf. Samuel, L. (2013). Shrink: A cultural history of psychoanalysis in America. Lincoln, NE: University of Nebraska Press. Sessa, B. (2012). The psychedelic renaissance: Reassessing the role of psychedelic drugs in 21st century psychiatry and society. London: Muswell Hill Press. Syman, S. (2011). The subtle body: The story of yoga in America.New York: Farrar, Straus and Giroux. Thompson, K. (1990). Stormy search for the self. Yoga Journal, 93, July/August.